Izutsu is the Japanese term for well curb—the parallel crossed supporting structure around a well—and this pattern has been used in motifs, designs and also literature since ancient times. Yotsuba means "four-leaf", or in this case four pieces, and tsugi means “joint”. It simply consists of a square held in place by four diagonal locking pieces extending from corner to corner. 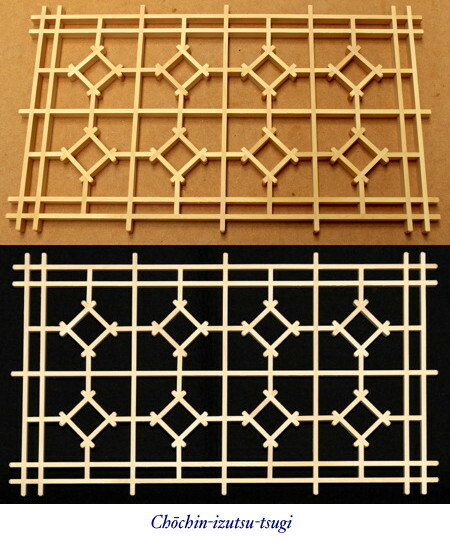 The izutsu-tsunagi is simply a series of interconnecting izutsu (well curb) squares. While there is nothing especially difficult about this pattern, the large number of joints very closely spaced does demand a very high degree of accuracy in the marking and cutting, so it can be quite time-consuming. This pattern looks stunning in a ranma, either by itself or in conjunction with another pattern, or as a bottom base pattern for a shoji. The first thing you will probably notice is that there are no jigumi squares, and this is the main feature of the kiriko patterns. 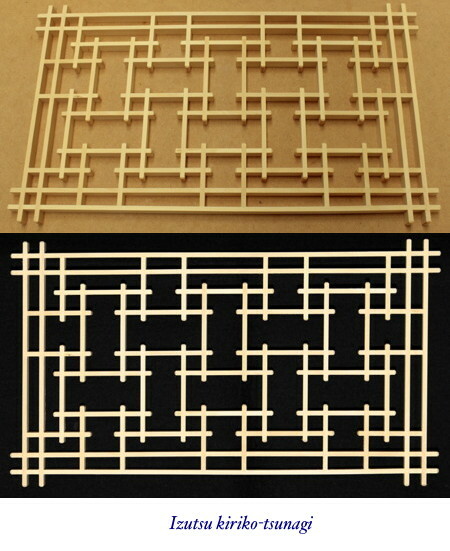 The term kiriko in this case simply means “cut kumiko”, and you can see that all pattern kumiko are cut; there are no full-length kumiko (except the outer framing kumiko). 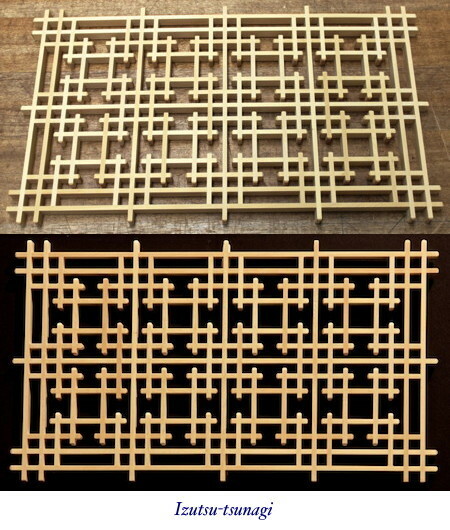 While this introduces a new dimension to the kumiko patterns, it is no more difficult to cut and assemble than any of the other izutsu patterns. Chōchin are Japanese paper lanterns, and in this pattern, the izutsu squares form a series of paper lanterns. 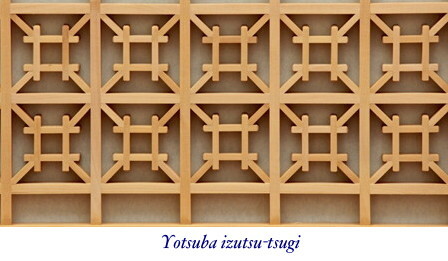 The four locking pieces for each izutsu square must be cut precisely so that the izutsu square is held exactly in the center of the jigumi square. Any inaccuracy here and the locking pieces and the izutsu squares will not line up correctly, and the overall pattern will look very mediocre.